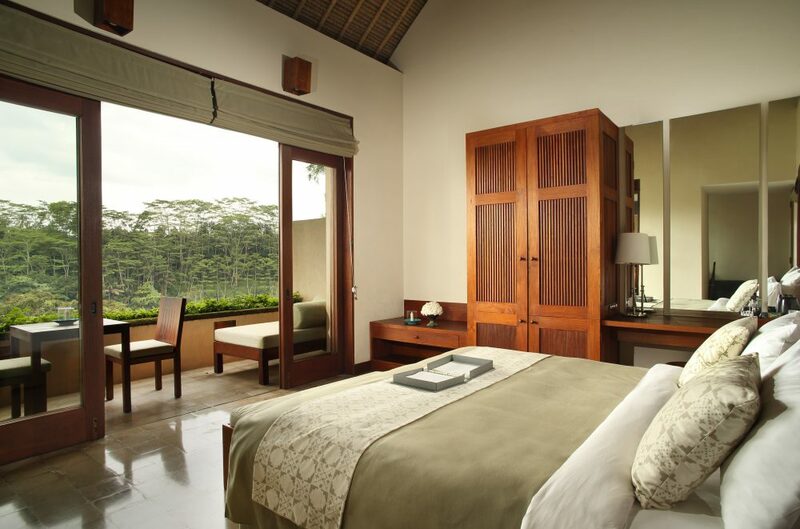 Deluxe Rooms : The 28 rooms are housed in 14 blocks designed to resemble a Balinese village. All rooms have panoramic views of the magical Ayung valley. The lower floor rooms feature individual garden terraces and a back courtyard with an open-air bathroom and shower. The upper floor rooms enclose a private balcony and unobstructed views. In-room amenities: mini bar, safe, IDD telephone, coffee and tea making facilities. iPod and docking station will be displayed in all Deluxe rooms. Terrace Tree Villa : From its lofty hillside perch on the sunrise side of the resort, the spacious 120 sqm Terrace Tree Villa invites you to unwind in the lap of nature above the rich jungle canopy, cooled by the valley breeze and calmed by the gentle ripples of the creek below. From its spacious terrace, look out to refreshing views of alang-alang plantations and rice paddies on the banks of the valley. Delight in glimpses of Ubud wildlife.